Veteran of the Greenwich Village folk scene Rod MacDonald performs on the Barnacle estate veranda, Saturday, December 8 at 7 pm. – part of the monthly “Under Moonlight Concert” series at The Barnacle. A regular on the Florida music scene since the 1990s, previously, MacDonald was a constant presence at many of New York’s most prestigious folk clubs including Gerdes Folk City and the Bottom Line. Today, in addition to performing all across the Florida, he teaches Music Americana at Florida Atlantic University. 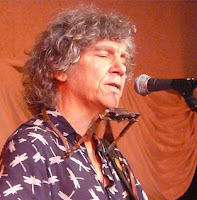 MacDonald plays a rhythmic style of acoustic guitar and sings in a clear tenor. He has considerable experience playing with bands as well – currently the lead singer in the local rock band, Big Brass Bed, which performs mostly Bob Dylan songs. Admission at the gate, is $10 (adults), $8 (Society members), $3 (kids 6 to 9), and free (under 6). Picnics, blankets, and lawn chairs are welcome. No pets, please. Gates open at 6 p.m., one hour before show time. For information, call 305-442-6866 or visit www.thebarnacle.org. The Barnacle is located at 3485 Main Highway.